The high value of personal possessions such as books, documents or knives encouraged the use of protective cases which could be carried on a belt for convenience. These were moulded and stitched in leather, and were close-fitting and light-weight. They are exceptionally durable, and have often outlasted the contents. Integral loops allowed the lids to be secured with a cord or thong. Such cases are sometimes depicted in 15th-century paintings and manuscript illuminations. They could be intricately decorated with fashionable ornament, personalised inscriptions and colour. Judging by the size and shape of this case, and the inscription BOIRE A TOUS ('Drink to all'), this case was for a drinking cup, which at this date could have been made of glass. 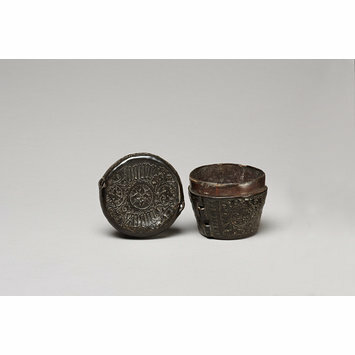 Since travellers in the Middle Ages usually carried their own eating utensils, there were a number of leather cases moulded to fit the shapes of cups, knives, forks, or spoons, which would protect the objects while they were being carried on a journey. On the underside of the case, the face of a man has been drawn in the leather using a sharp knife. Its a wonderfully vivid reminder of the skill of its maker, and perhaps the character of the cup's original owner. Circular case for a cup, of cut and embossed leather (cuir bouilli). On the cover are the words BOIRE A TOUS. There are six loops for a cord. The ornament consists of floral scrollwork in two compartments. The cover is decorated on the top with a rosette surrounded by a band of leafy scrolls, amid which is the inscription in Gothic characters; round the edge are two panels also filled with floral scrolls. On the bottom is a male head wearing a hat, deftly cut with a few, expressive strokes. With a pasted label [red printed numerals] '1987'. The case and lid each formed from 2 parts of leather of several thicknesses stitched together. Notes by William Thorpe, 1957. COVERED CASE FOR A DRINKING CUP. Sewn and wrought leather. Container consisting of two layers, the inner layer including the thrust[? ], the outer layer wrought decoratively. Cap consisting of one layer wrought decoratively. No lining. Brown colour of thrust [?] probably representing the original colour of the exterior, now sable. Straight sided, nearly cylindrical, container, and corresponding close-fitting flat-topped cap. On the container, two pairs of eyes, and on the cap one pair, for a thong long wanting. Decoration in slight, smooth, relief, against a stippled ground. On the containers paired panels of leafed scroll work in a symmetrical arrangement, with corresponding panels on the sides of the cap. On the top of the cap, a central rosette surrounded by a border of leafy scroll work, incorposing in Gothic letter the words BOIRE followed by ATOUS. On the base an unpermited drawing, with trial strokes near, in incised line, of the head of a bald man (probably a monk), apparently drawn before complete cooling of the leather. 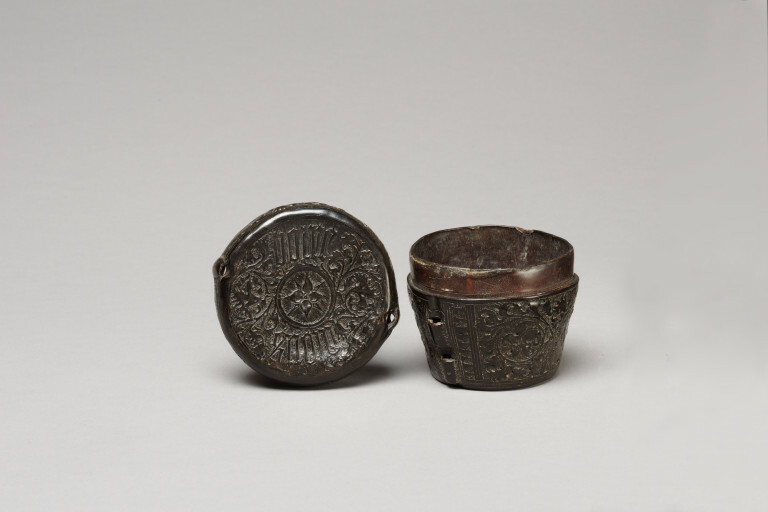 Since travellers in the Middle Ages usually carried their own eating utensils, there were a number of leather cases moulded to fit the shapes of cups, knives, forks, or spoons, which would protect the objects while they were being carried on a journey. As such objects were often made of costly materials, their value alone warranted the making of cases for them, often with rich decoration. Lavishly tooled and painted cases made for the imperial crown and ceremonial sword of the Holy Roman Empire have survived, while others less ornately adorned and identifiable by their shapes as cases for a variety of eating utensils and drinking vessels are not uncommon. At this early date, the type of beaker held in this case could have been glass.